Cortes was born in the city of Medellin, Spain in 1485. Little is known about his earliest years. In his late teens Cortes entered the Spanish army in hopes of finding his fortune. Where he lived was void of economic opportunities so he decided to seek his fortune in the New World. Hernan caught his first ship to the New World when he was only nineteen. Then in 1518, he began assembling men and supplies for his fabled trip to the Yucatan Peninsula. On February 18, 1519, he left Spain with 550 men, and sixteen horses. Cortes and his men landed on the island of Cozumel. Next, Cortes and his men began traveling westward in the direction of Tenochtitlan. Before long, they were met by emissaries of the great Aztec ruler Montezuma. Montezuma sent them gifts of gold and gems, but told them not to come any farther because the journey was too difficult. However, Cortes had no intention of stopping. As the Spanish entered the Valley of Mexico they were astounded at the beauty of Tenochtitlan, as the pyramids and temples just seemed to rise out of the water. Then as they neared the city they were greeted by Montezuma. Again, more gifts were exchanged. This time they were told that they would be welcome guests and that they could stay in the palace of Montezuma’s father Axayaca. Almost as soon as they arrived the Spaniards heard rumors that there was treasure in Axayacas palace, but they had no idea where it was hidden. Shortly after their search began, Alonzo Yates, a carpenter, was looking for a convenient place to put a religious alter when he noticed that a doorway had been closed up and plastered over. Behind the door, Cortes and his men found more riches than they ever imagined. Shortly after the find, word came that some of Cortes’s men had been attacked and killed. Immediately, Cortes went to Montezuma’s palace and confronted Montezuma about the killings. 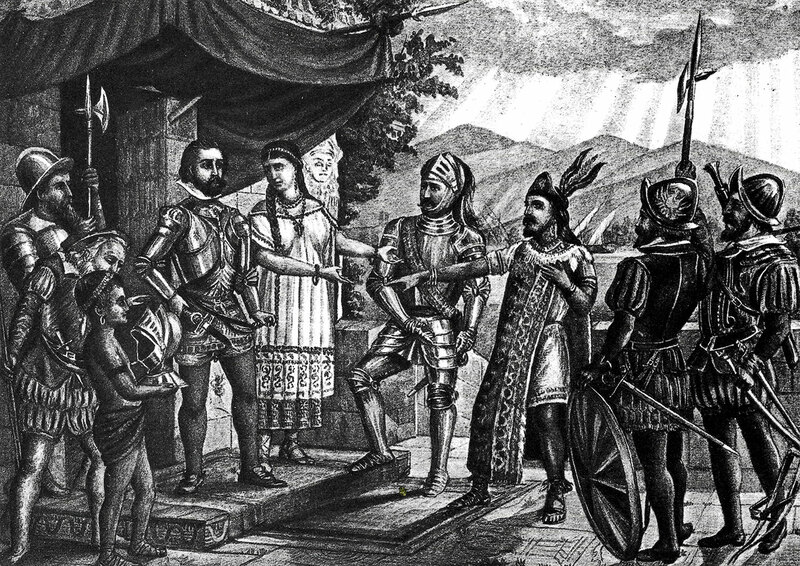 Montezuma denied having any involvement, but Cortes seized the moment and kidnapped Montezuma, taking control of the city. While Cortes was away in Veracruz, he left Pedro de Alvarado, and his men in charge of Montezuma and Tenochtitlan. During an Aztec celebration, in honor of their war god, the Aztecs began drinking and dancing. When the celebration was at its height, Alvarado attacked the largely unarmed Aztecs killing hundreds. The city was at war when Cortes returned. Desperate, Cortes asked Montezuma to get on top of a roof and tell the Aztecs that they would leave the city. However, as Montezuma spoke he was struck with stones thrown by his own people who no longer believed in him. He died three days later. Cortes loaded down a group of Tlaxcalans with gold and gemstones for himself. Thousands of Aztecs attacked and it was every man for himself. Cortes and much of his gold escaped, but over 450 of his men died as well as 4,000 Aztecs. Cortes decided to again attack Tenochtitlan in hopes of more hidden riches. This time Cortes attacked with 900 Spaniards, 80 horses. They used crossbows, guns, cannons, and swords. Fighting continued for weeks. Starving, the Aztecs gave up on August 13, 1521. Among other things, King Charles V rewarded Cortes with twenty-two encomiendas (land grants) and twenty-three thousand Indian slaves. He was also awarded with the title of Marques del Valle de Oaxaca.